this silver niello nib holder and letter opener bears Kokoshnik marks used in Russia from 1908 -1926, maker I.P. Prokofiev, who was a master in a silversmith's in a suburb of Moscow (Danilovska) from the late 19th century until 1908. The nib is chased, nielloed and engraved with scrolls while the blade on the opposite side has a niello decoration with the word KAVKAZ (Caucasus) in cyrillic letters. 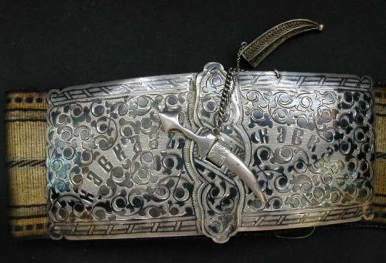 The production of nielloed objects of asiatic taste had a wide diffusion in Russia, particularly in the shape of belt buckles (see below an excellent example) and traditional caucasian or cossack daggers (kinjal or kama), while is uncommon for a nib (this is the first example I've seen). The nib holder is 6 3/8 in. long (cm. 17,5) and was bought from a Canadian dealer through the Internet.